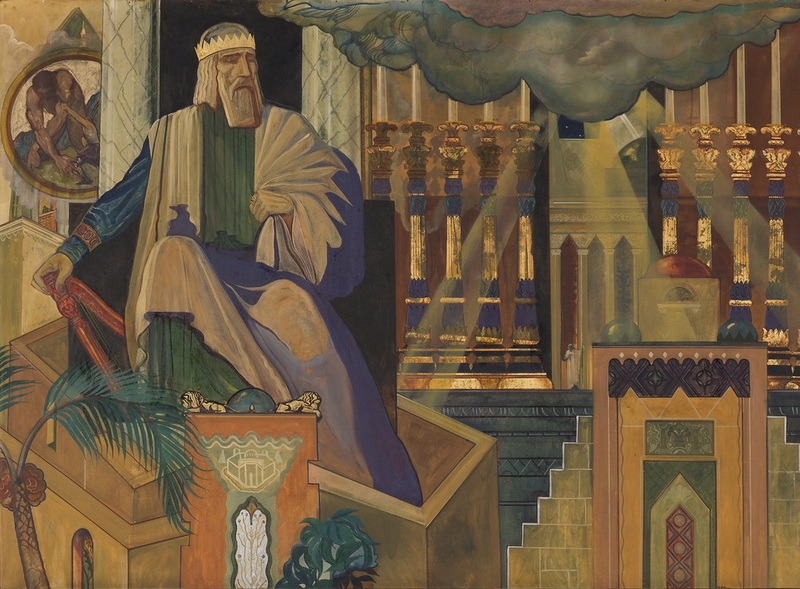 Mural Description From the Lectures of Rabbi Edgar F. Magnin, 1929-1930: "To the right of King Saul is King David dreaming of the Temple of the future, which he was not permitted to build, but which was erected by his son Solomon. The walls surrounding his feet symbolize royalty, protection and (his high) position. Beneath him is a medallion containing his battle with the (Philistine) giant Goliath. Thus we see him in the fierceness of his youth...and dignity of his old age." "Defining moments" propel people in new directions. King David's defining moments made him a remarkable, yet very human King. The Biblical Book of Psalms are poetic prayers that we are used in Jewish life for ritual, prayer, song, study and meditation. They provide an emotional response to many kinds of situations that happen to both the individual, and to the Jewish people. How can the experiences of Biblical figures help us to understand our own challenges and choices? How do characters like King David change? In what ways can poetry like the Biblical Psalms help people express emotions like joy and grief? Read in Primary Text: Understanding Jewish History 1, Sol Scharfstein, Ktav, 1996. "Appoint for Us a King; Saul A Troubled King; The House of David", pages 28-33. Consider a moment, an influence, or an experience that changed the direction you were taking in your life. From time to time, people have experiences that change the way they see themselves, and their circumstances, and cause them to look at things differently, and behave differently. These experiences, which can be both positive or negative, can be called “defining moments”. These moments happen when situations direct our lives onto a new pathway, and cause a turning point, a crossroads, a dramatic moment or crisis. Defining moments stand out as they redefine our lives and make them different in the future. Defining moments change the way we think and behave. Often we see these defining moments acted out in the lives of characters we read about in books. We saw this in our exploration of the Hero’s Journey. When reading about great figures in the Bible and in Jewish history, identifying and understanding their “defining moments” makes them more human. We are continuing our journey through the mural by focusing on this image of King David, one of the greatest Jewish leaders who had many defining moments which made him the man he was. As his life is well documented in Nevi’im—the Book of Prophets, we can discover what events happened in his life. In this activity we are going to get to know King David-- and the defining moments that made him a remarkable and memorable King of Israel. 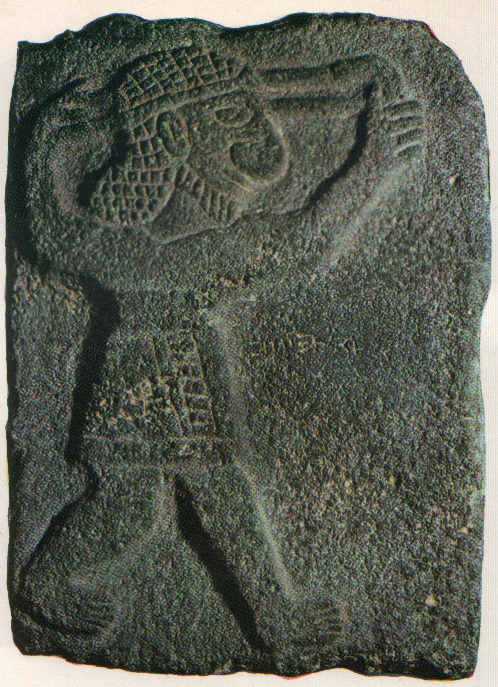 Archaeological Find at Tell Halaf of a soldier with a slingshot, 10th century B.C.E. Working in pairs, use the information you read to complete the Graphic Organizer King David's Defining Moments. As a class, discuss the defining moments, putting them in chronological order. Discuss: what circumstances led David to these experiences, choices, opportunities? How did they cause David to look at things differently and/or and behave differently? In groups of 4-6 students create a short script, assign roles, assemble props and enact their chapter of David's life. Drawing upon their Defining Moments Chart and the biography, each group will write a short script which dramatizes their section of the story. Assign a director and parts for the skit. Draw a diagram that shows how each actor should move on the "Stage" to communicate the action of the story. Have students use a highlighter to highlight their roles in the script. It is a good idea for each student in the group to use a different color highlighter or for students with multiple roles to highlight each of their roles in a different color. 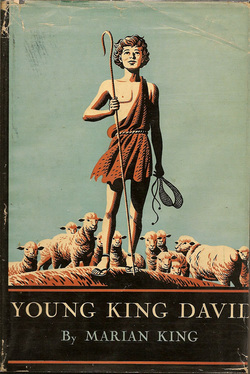 CLICK HERE TO SEE THE KING DAVID SLIDESHOW. Look at the different ways artists have portrayed David and his defining moments. How have the artists expressed the emotions of the moment? Choose one images from the website to project and use as a backdrop or each group can select images to insert into a powerpoint. The teacher can project the select group of images for each presentation. After completing Activity #3 below, have each group select and dramatically recite one of David's Psalms to open or conclude their scene. Work with them to choose a Psalm that fits the narrative of their scene. The Psalms are a collection of 150 poems and songs written by King David and others to express strong emotions during times of joy and grief. Although the Psalms written by David reflect his fears and faith, his anger and acceptance, his joy and hope, these prayerful poems still speak to us today and remain a source of inspiration. 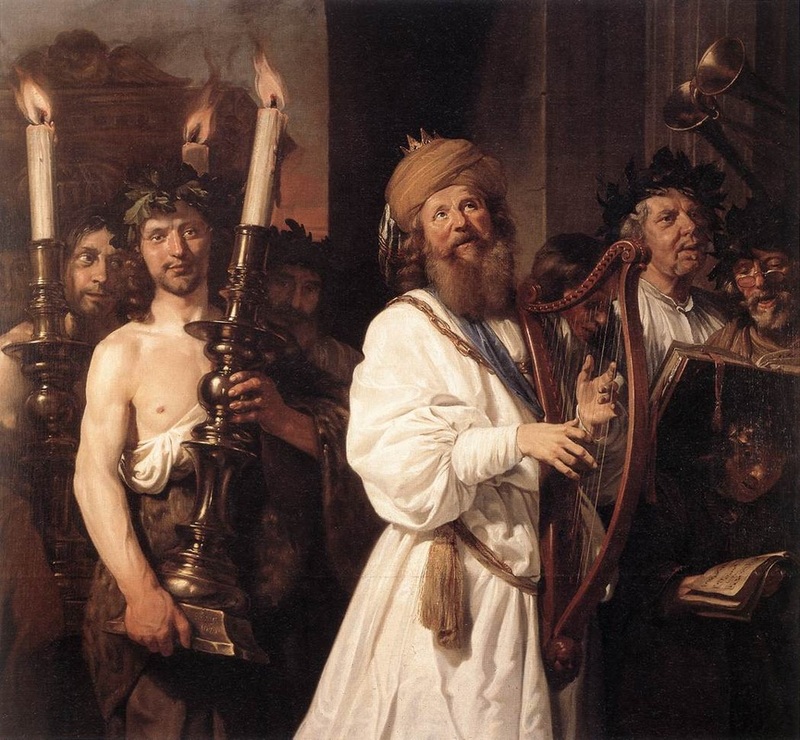 The Levites originally sang the Psalms in the ancient Temple, accompanied by harps and cymbals and other musical instruments. They were also sung during the great feasts of pilgrimage – Passover, Shavuot and Sukkot – as Israelites made their way to the Temple in Jerusalem from the surrounding countryside. Not all the Psalms were composed by king David. Some were composed by Adam, Shem, Abraham, Moses and others. King David collected them all and added his own Psalms. Today the Psalms accompany us through the Jewish life cycle. They are woven into the Siddur and our daily and weekly prayers, they are recited as wedding vows, they have become healing songs to comfort the sick, and are recited at funerals to support to the grieving. Many complete Psalms and verses from Psalms appear in the morning services ("Shacharit"). Psalm 145, commonly referred to as "Ashrei", is read three times every day. These short and accessible example of David's Psalms can be be read by students. Psalm 133 -- The Psalm that inspired the Hebrew Song "Hine Ma Tov"
Read together Psalm 133, first silently and then aloud as a class. Analyze the Psalm by asking the questions below. Identify the Voice of the Psalm: who is speaking and who is being spoke to? Sometimes the Psalmist (person writing the Psalm) is speaking to God, or others, or himself. Sometimes others are talking, sometimes God is the speaker. Detect and describe the emotions and feelings in the Psalm: a psalm is always a response to a specific situation, such as trouble or joy, fear or hope--ask the students to identify the. Ask students to imagine the situation that the writer might be responding to. This gives students practice in naming emotions an leads to discussions about the need that is being addressed. Click here Emotions Vocabulary Chart. Make copies, and let students NAME the variety of emotions expressed in the Psalm by referencing the chart. Discuss the Types and Uses of Psalms: Psalms were to express praise or to express lament, such as anger, bitterness, pain, disappointment. Others gave thanks to God or were "Songs of Ascent" which spoke of "going up" on pilgrimage to Jerusalem. By listening to, and reciting the Psalms, you are hearing the authentic voice of King David-- and other that lived over 3000 years ago in his time. Sing one of the familiar Psalms together: Invite a music teacher to come to class to sing with students Hine Ma Tov, and other psalms of David that have been put to music and sang for thousands of years throughout the world. When have they sang that song together? Discuss how it makes students feel, the emotions it brings up. Assign one of the Psalms above to groups of 3-5 students (or select Psalms of your choice.) to explore additional Psalms in small groups. Click here for a Graphic Organizer for students to complete. Ask students to complete the steps above with their assigned text. Make copies of the Emotions Vocabulary Chart (above) for students to reference. Ask select students to take turns reading the Psalm aloud with the emotion suggested in the text. Activity adapted from David Blumenthal, "Teaching Psalms in a University Setting,"